Why communication between Health Care Professionals and patients is essential? On 19th May, 2018 (Saturday) we conducted a workshop "Essentials of Communication, Communication between doctor and patients and a key topic on Breaking Bad News". The workshop included couple of lively discussion. Our intent for this workshop is to educate health care professionals with added skills for their daily practice. Go here to read more. 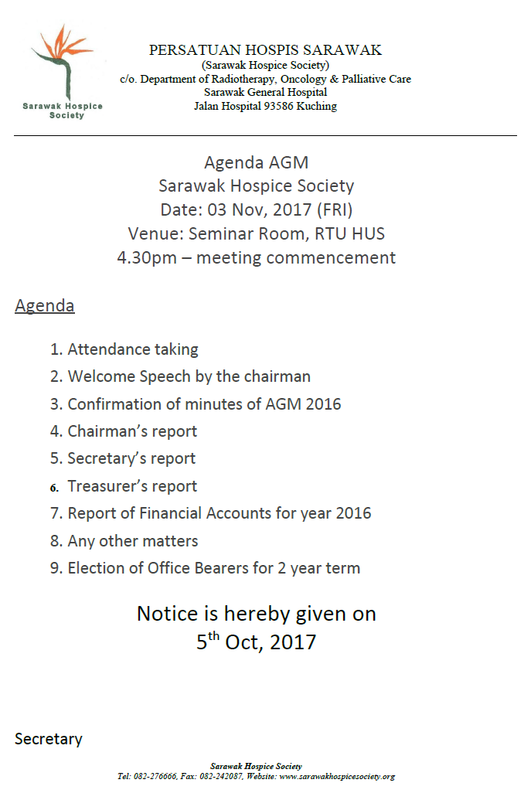 Our 2018 Annual General Meeting will be held on the 24th March, 2018 at Society Registered Office at 1st Floor of Lot 2067 Block 10, KTLD Jalan Tun Ahmad Zaidi Adruce, 93150 Kuching, at 3.00pm. See attached Notice of AGM. Notice is given on 1st March, 2018. 'KPJ Cancer Awareness RUN 2017' at MBKS, 27th Nov, 2017. "ROAD SHARE RUN" organised by Hornbill Pacesetters Running Club donated generously to Sarawak Hospice Society a sum of RM10,000.00 for helping the terminal ill patients in our Home Care Program. See Picture here. The 11th Annual Meeting of SIOG, 4-5 Nov, 2011 – International Society of Geriatic Oncology (SIOG), will be held in Paris, France. It is during this auspicious occasion that SIOG honors each year a prominent world expert in the field of Geriatric Oncology with the Calabresi award, named after its first president: Dr Paul Calabresi. See the Paul Calabresi Memorial Lecture Award here . "Early Detection Program focusing on primary and secondary health care providers achieved major and sustainable reduction of the late stage diagnosis of breast cancer"
See the Certificate and the Letter from ESMO informing of the award here! The 25th Anniversary of the Department was celebrated on the 20th of September, 2010. The Guest of Honour for this function was YB. Dato Dr. James Dawos Mamit, Deputy Minister of Tourism, Malaysia. He presented certificates of appreciation to 'Friends of Cancer Patients' who are NGOs who have been helping our patients in activities to improve their quality of life while undergoing treatment in the Department. The Minister also took a tour of the newly renovated male & female wards. Go to Gallery to view the pictures! Radiation Oncology Workshop of the Forum for Nuclear Cooperation in Asia (FNCA) was held in Kuching at Riverside Majestic Hotel on 18th-21st January 2010. This workshop was attended by participants from nine countries. The workshop discussed on research protocols related to nasopharyngeal and cervical cancers. There were open lectures held at Sarawak General Hospital that dealt with modern techniques of radiotherapy with cyberknife and heavy ion beams. The International Scientific Paper Writing Workshop was held in the Department of Radiotherapy, Oncology & Palliative Care from the 18th-22nd June 2008.